Here we are for Part 2 of my 2016 makeup favorites. In Part 1 I told you all about my favorite products for the base and the face so now let’s take a look to eyes and lips. As I mentioned before, on the Youtube channel I split my favorites between Italian and other makeup, but on the blog I divided it by product type. So lets take a look at my favorite eye and lip makeup. Those brows though! They have been a huge trend for the past few years and Anastasia Beverly Hills has been the indiscussed queen of eyebrows, taking up a huge part of the market and being one of the first to launch innovative products. Among these, the Anastasia Beverly Hills Dipbrow Pomade was incredibly hyped and I was one of those convinced to buy it by all the YouTube and blog reviews. After absolutely loving and using the DipBrow for two years, I finally found something that looked the same and cost way less: the NYX Tame&Frame Tinted Brow Pomade. Today I want to compare these two brow pomades, show you swatches and application, to determine if NYX has actually made a dupe for the Anastasia Dipbrow pomade. Good morning beauties and happy Monday! Today we’re talking about a topic that is really close to my heart: brows. They have been all the rage these past year and still going strong all over instagram and the blogosphere. 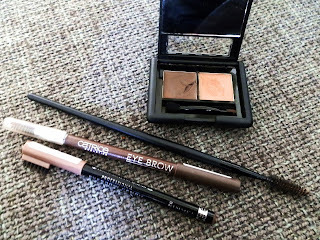 From ombre brows, to sculpted brows to natural brows, there’s something for every style, and here are my top 5 brow products to achieve your perfect brow. Good morning beauties! I am back from my ski holidays in the Dolomites and this means the blog is back as well!! For the past week I wore little to no makeup because of wind, snow, sport, wearing a helmet and goggles. Two things I wore were mascara, rigorously waterproof, and brow gel. The particular one that came with me to the Italian Alps is the L’Oreal Brow Artist Plumper. As I discussed in a previous post, full brows are still on trend this season and for those of us who are not blessed with full brows or who have over plucked over the years, makeup comes to our rescue with a wide range of products! Brows come in infinite shapes but here i will show you something that will work for all. First of all we have to find the right shape for our face! 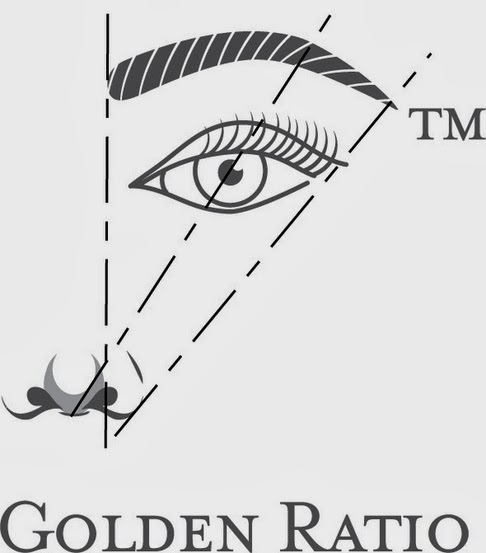 The general rule that is to use the golden ration to trace 3 points on your brow: the beginning, the high point of the arch and the end. With a pencil or a brush, find the point where your eyebrow starts by finding the point vertically from your nose upwards. Trace a small dot there and move on rotating until your pencil crosses the pupil of the eye. This is the spot where the high point of the arch should be. Finally follow the line from the nose to the end of the eye and further to find the optimal ending point of your brow. 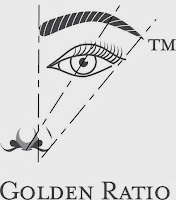 Once you have traces these three points, just connect them to each other to obtain the perfect brow shape. eyebrow powder: for a more natural look we use specific powders or even eye shadows. we apply them with a small angled brush in small strokes in the direction of your natural hair. You can set your work with with clear mascara. This is the method I prefer and I use the powder included in the Elf Eyebrow Kit. eyebrow wax: is applied the same way as a powder but stays put longer and can be used as a base for powder itself. You can find all these products in every drugstore and is up to you to find what is the method that suits you (and your brows) best. Regarding color, dark haired girls should go with a shade lighter than their haircolor, whereas blondes should go 1 or 2 shades darker than their haircolor. Also, when picking a color, stay away from warm tones and go for cool browns. The billboards and runways have flooded us for the last year with beautiful models with big full eyebrows. One of the most iconic models to bring back this trend is Cara Delevigne with her signature dark brows and blond hair. 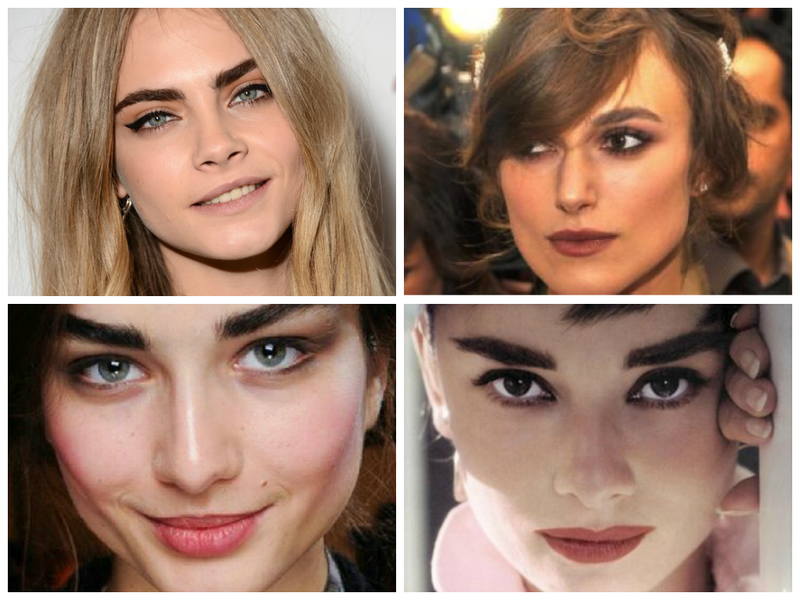 At first I could not bring myself to like this trend, but looking at other models like Keira Knightley, I realized that the only thing I really don’t like is the big contrast between the color of the hair and of the eyebrows. When I look at other actresses/models, full brows definitely make their eyes more interesting, the whole face is framed and balanced. Looking back in the years you can also find the classic beauties such as Audrey Hepburn and Elizabeth Taylor have these thick and groomed eyebrows. In the nineties we started seeing more and more thin eyebrows like Pamela Anderson and Kate Moss. Trends are trends and everyone embraced it and ended up with some permanent damage. In fact over plucking your eyebrows for a long time will cause them not to grow back! So what you end up like the lady in this article resorting to eyebrow transplant! They will take hair follicles from the back of your hair and put them where your eyebrows used to be. Scary! Personally I used to have really thick eyebrows as a child and to compensate for that, I started plucking them A LOT. Becoming a bit more aware of what looks good on me and what doesn’t, I decided thin eyebrows didn’t! It’s been 6 months now that I have been trying to grow them back and it’s working, slowly, but working. Thankfully makeup comes to rescue disaster eyebrows and there are many techniques and products to help achieve the eyebrow you wish for. But this discussion will take up a whole other blog post coming soon! What do you guys think? Do you like the full or thin brows? Do you do anything for them or are you blessed with perfect shape?